I thought The Force Awakens was pretty darned good. Like a lot of other fans (and I'll note that my SW fandom is strong, but limited...), I left TFA with a general feeling of, "Man, that's what I've been waiting for to continue the Star Wars saga..." After seeing Rogue One, The Force Awakens seems like it might have stuck to "the formula" a little too much. TFA's characters were great, and I know it needed certain elements to truly continue the Skywalker saga, but after seeing what Rogue One did to stretch that Star Wars formula (while still feeling very much like a piece of the legend), I'm kind of thinking, "Maybe that's what I've actually been waiting for to continue the Star Wars saga..."
And I get that it doesn't really continue the saga. It expands it, I guess. Man, even the relatively weak parts of the film (I do have a few small...nitpicks, I guess) really aren't that bad. Early on, I was afraid I was in for two hours of 45-second vignettes that would stitch together to tell us what happened. The last time I had that feeling was early in Batman v. Superman, and that didn't turn out so well. The storytelling really came together, though, and I think it might actually be the most emotionally powerful of any of the Star Wars films. I totally get what folks mean when they say it's basically a war movie set in the SW galaxy. It is, and it's a really good one. If you're reading this and are on the fence about seeing it in theaters, I definitely recommend checking it out. If you're on the fence about springing for 3D, I recommend that too. It's quite a beautiful movie. 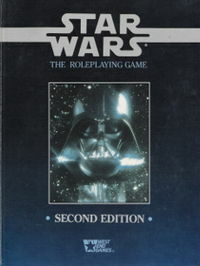 Now...to find a Star Wars RPG campaign to play in. Or maybe run. Seems like a great time to finally take White Star for a spin...or pull out the old West End Games version for another run.